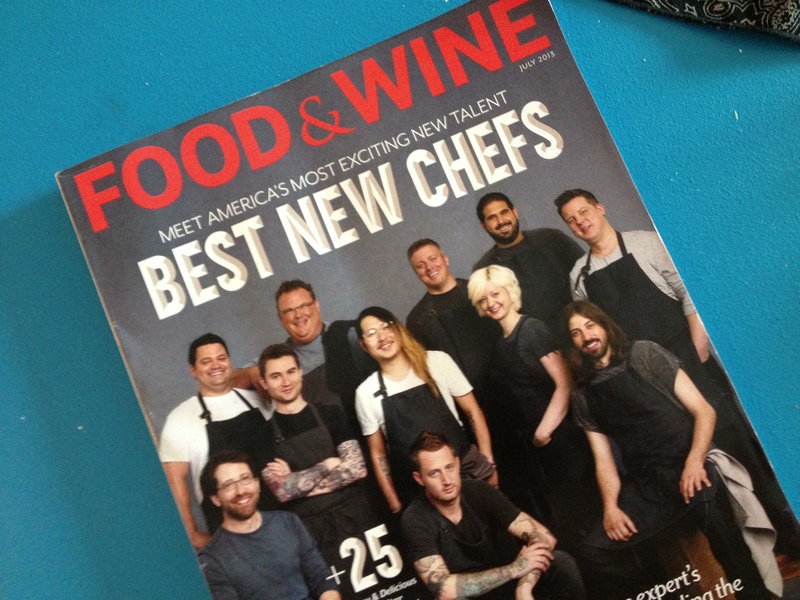 I hated July’s Cover Recipe Challenge. Why? There are so many reasons. This is a late posting; usually I have the challenge and the post completed by the end of the month. I was actually going to pretend that I didn’t do July’s cover recipe, but once I set my mind to something I want to finish it. That being said, I was so annoyed with the result of the cooking that I did not even want to write about it… Well, here it goes. The covers were different! 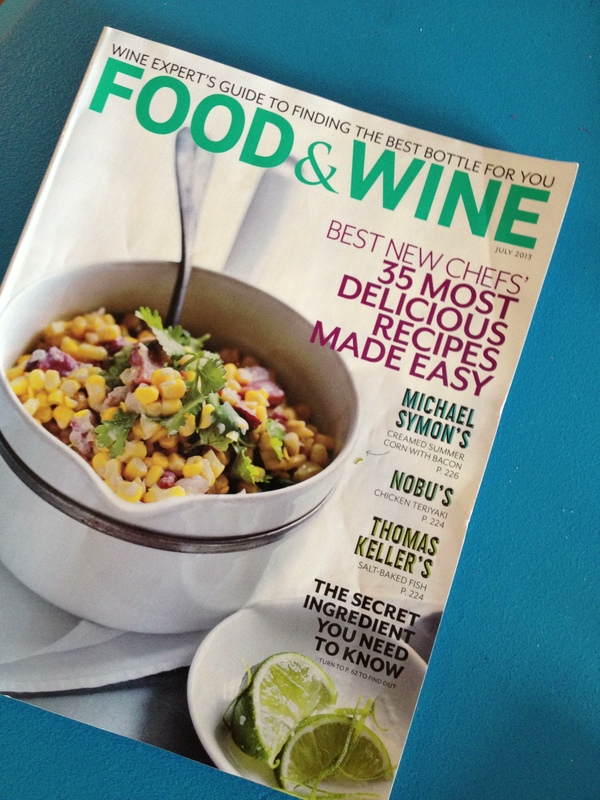 The cover recipe for the first copy I got was Michael Symon’s Creamed Summer Corn with Bacon. I was not impressed. Creamed corn? Never liked it, and it always reminds me of hospital food. Ew. But, like the true cover recipe challenge warrior, I planned my meal around the dish, choosing to make Mussels with White Bean and Chorizo to start, followed by Triple Pork Burgers with Quick Cucumber Kimchi, the notorious corn, and roasted potatoes. Why didn’t I just forgo the newstands’ cover for the freedom of choosing whatever I wanted in the other copy? I do not know, I guess I am stubborn. To start the evening off, I choose the “7 Minutes” recipe feature for July: Michael Schlow’s Mussels with White Bean and Chorizo. I choose them because a) I love mussels and b) it looked like a simple recipe to start off an evening of complicated dishes. And easy it was. All I had to do was combine the ingredients (cherry tomatoes, crushed red pepper, chorizo sausage, and white beans) in a pot and steam the mussels in the delicious smelling broth and bam! There is your appetizer, and a very delicious one at that! 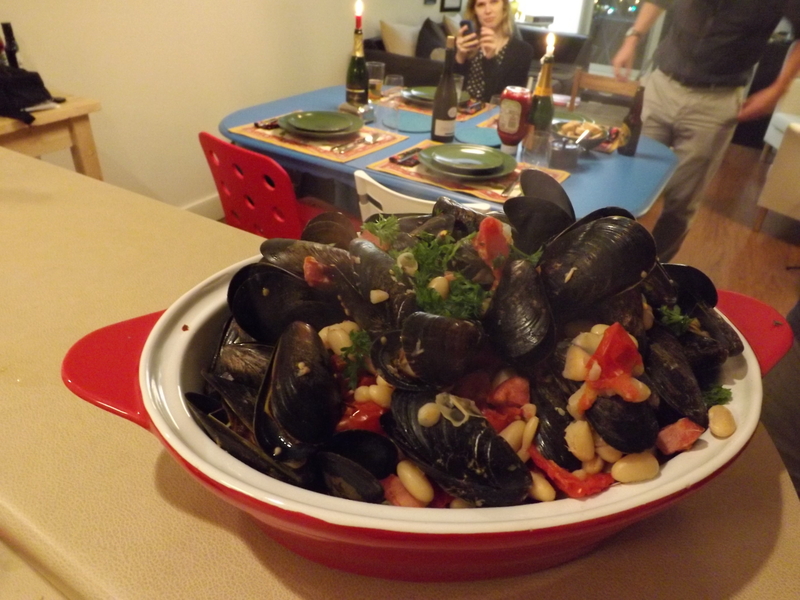 Everyone at the table enjoyed the mussels. 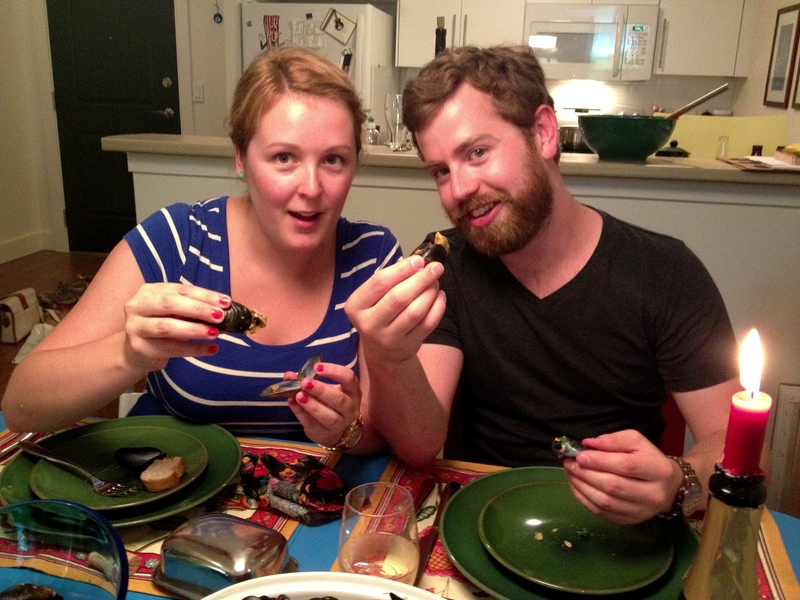 Erin and Matt, who joined us once again for the challenge, taught Adam and I a little trick about eating mussels. They taught us to use an empty mussel shell to pinch the meat out! How, as a Newfoundlander and someone who eats mussels all the time, I didn’t know about this trick, I don’t know, but it has changed my life. I was amazed! 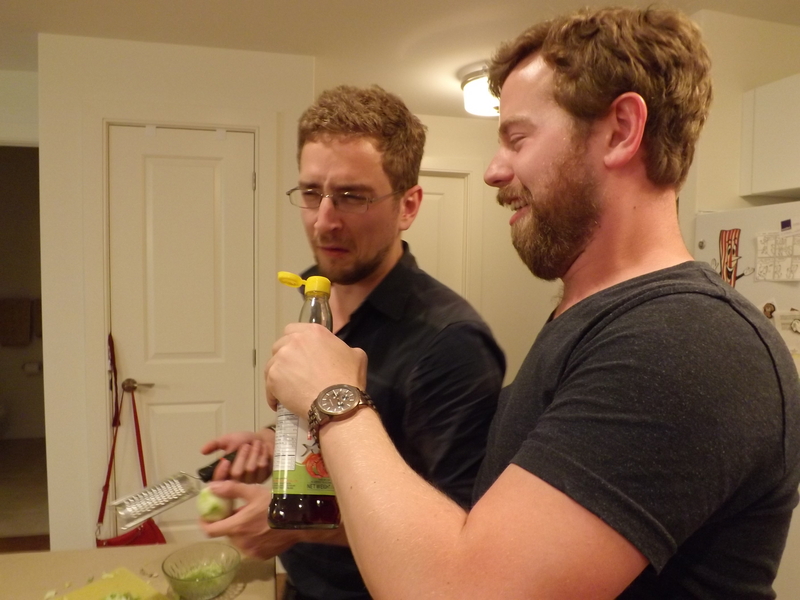 So, the appetizer went well. This is where it starts to get complicated. 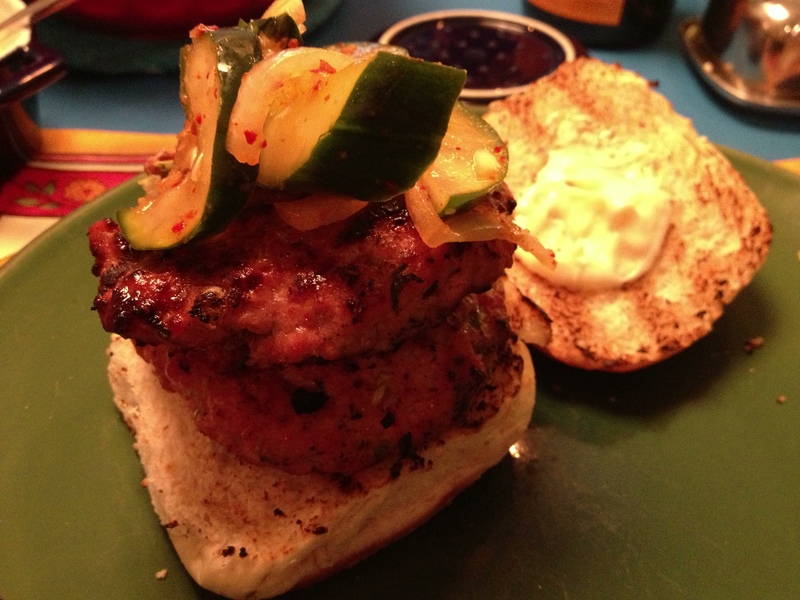 The main course for the evening was Triple Pork Burgers with Quick Cucumber Kimchi. 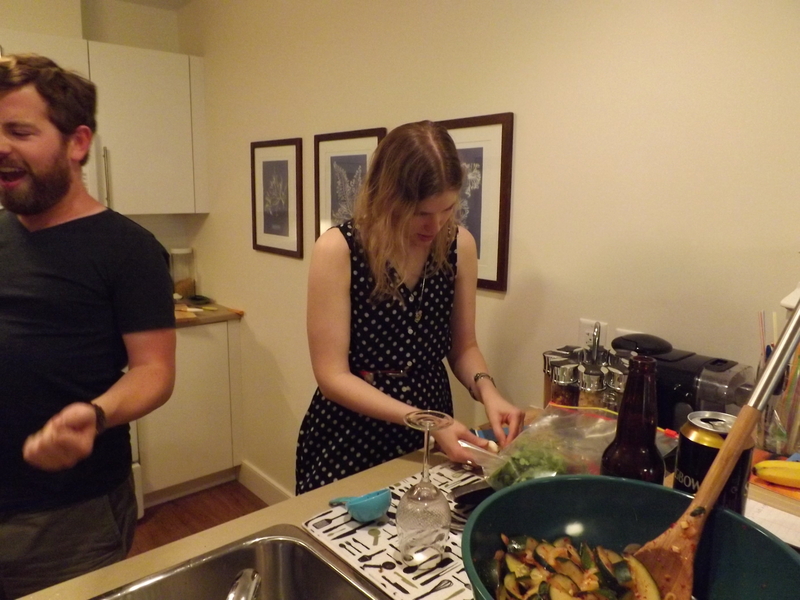 Adam and I prepared the kimchi beforehand because it had to sit for 2 hours in order to turn into kimchi. 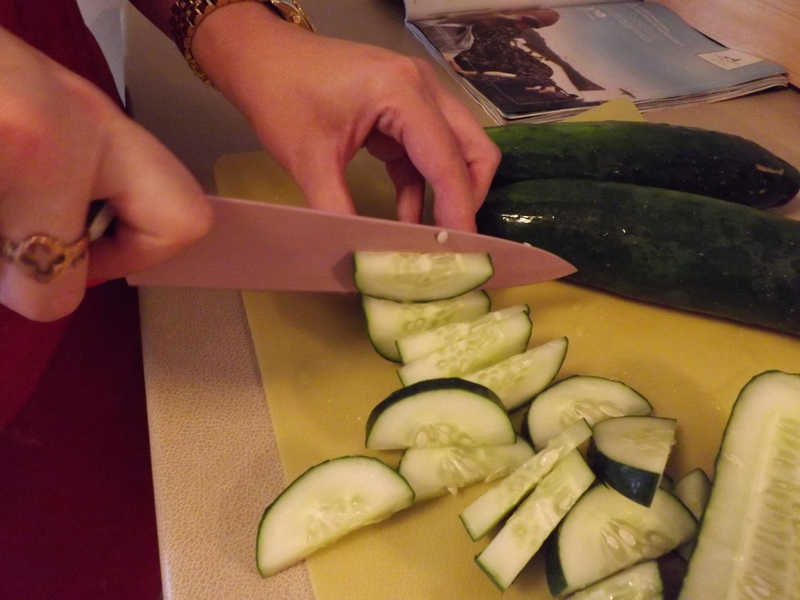 Those vegetables pretty much turned themselves into kimchi with a little slicing and coaching from me. Basically all I had to do was slice up a crap load of cucumbers (2lbs in fact) and add garlic, ginger, salt, gorchugaru (Korean dried red peppers), sesame oil, and fish sauce and let it sit for two hours and VOILA! Cucumber kimchi! Usually kimchi actually takes several days to ferment and become the delicious Korean condiment that we know and love, but this quick kimchi liquified before my eyes, and stirring occasionally for a few hours was enough to turn it into something delicious. I loved this recipe and will definitely use it again! Once all the ingredients were finally chopped. Adam and I made the patties. They were supposed to be done very thinly, which was really hard to do because of the thousand ingredients in the patty and the fact that there was no binder to keep the raw meat together. It was really frustrating, and took a long time to make them thin enough to be stacked but thick enough not to fall into the BBQ at the same time. In the end the burgers actually tasted amazing. 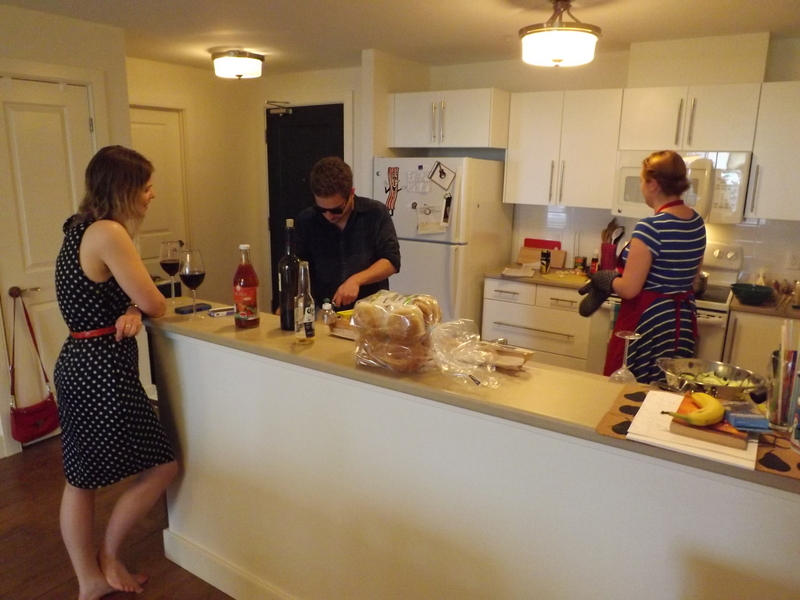 Despite how long they took to prepare, the cilantro, lime, and other thirteen ingredients in the patties were so flavourful and the kimchi was the perfect condiment. If I ever used this recipe again, I would probably tweak the patties to make them a little denser and easier to make. I didn’t read the recipe before I bought the ingredients. Because of this, I bought frozen corn instead of corn on the cob trying to shortcut the recipe so I wouldn’t have to cut the corn off the cob. Lazy. The result of this was not having the cobs reserved to make the broth for the creamed corn. Now, don’t get me wrong, I do not think that I completely sabotaged the recipe by being cobless, but I could not get the broth to thicken. Was it because of the lack of cob? I will never know. All I know is that the recipe had lots of yummy ingredients like bacon and sour cream so I thought it might turn out okay. But, like the other recipes that evening, it took a long time to make. An hour and twenty minutes to make creamed corn? You’re kidding me, right? I am sorry, but this is not a recipe that I will ever make again, not even to see if I can thicken the broth with those stupid cobs. 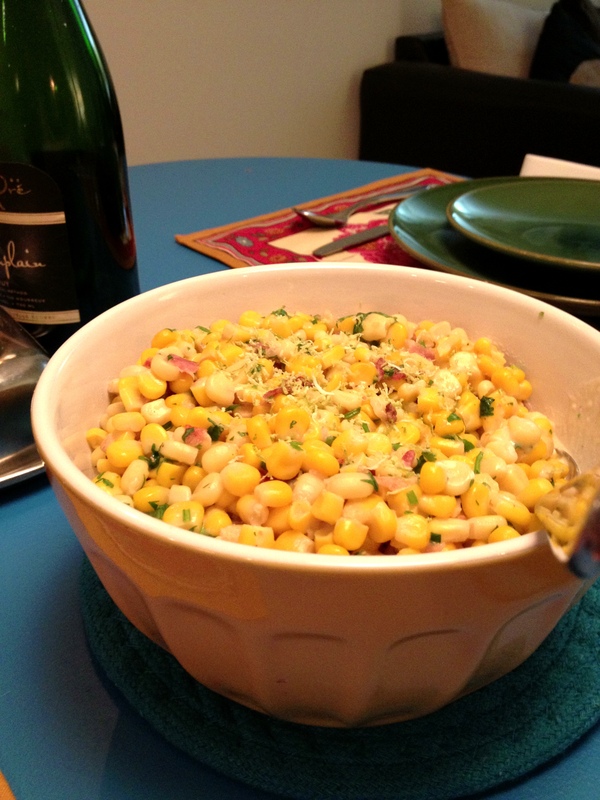 Granted, the corn actually did taste pretty good despite the lack of creamyness. Everyone enjoyed it, and I have to say, it probably was some of the best creamed corn I have ever had; the bacon, sour cream, and coriander made it rich and savoury. However, it will also probably be the last time that I make creamed corn. To those reading this, you may think “Well that didn’t turn out so bad.” It is true that everyone at the dinner enjoyed the meal and the food was good, minus the not-so-creamy creamed corn. I just didn’t like making these particular recipes. The pork burgers were overly complicated, and though I was thrilled with how the kimchi turned out, I will never make them again, and don’t even get me started on the creamed corn. I love to cook and for some reason, none of these things were enjoyable to make. I really look forward to these challenges every month because I make things that aren’t in my usual repertoire and I really challenge myself into cooking and eating new things. This month felt average and just not fun. Hopefully August’s challenge will be better, I am cooking that next week. Stay tuned and wish me luck.